The DVD drive not working issues really embarrass you, especially when you want to watch a movie. For instance, you may unfortunately loss or miss the DVD drive after Windows 10 upgrade. It isn't showing on Finder, is unable to read or recognize any discs on your computer. You will be informed of an error message or get a blank screen when trying to access the disc, even though Windows Explorer in Windows 7 shows the DVD icon. Considering troubleshooting to problems has been highly demanded among desktop and laptop users, here we deliver a cover-all solution if your optical DVD drive won't show up, open or read discs. Prior to troubleshooting the errors, let's have a recap of what causes the DVD drive problems. 1. A physical problem with power connection to the drive. For example, something (IDE/SATA cable) is unplugged. 2. A Windows operating system problem may stop the computer drive from showing up or reading discs. 3. It could be that disk is scratched up, bad or dirty, thus it's unreadable by your player. 4. The DVD drive is not working properly on Windows 10 might be as a result of a combination factors: corrupt driver, a factory defect or out of date firmware. Freely backup DVD to hard drive and rip DVD to MP4, MOV, M4V, etc for digitally playing on PC, Mac, iPhone, iPad, Android without DVD drive anymore. No DVD drive not working/opening/readin discs error. 1. Prior to the remedy for DVD drive not working problem, please make sure the drive and DVD are clean. If your computer drive not reading disc error continues, it might be the disc drive itself. This is also feasible if the drive on Mac not working/reading discs. 2. Verify the drive cables are connected properly and securely. 3. Boot from the Windows disc, if you are facing with a Windows driver issue. 4. Try another DVD or try to load the non-working DVD into another drive, if the DVD hard drive won't play the DVD, though it opens and works with Windows. 5. Open Run > type control and press Enter > type troubleshooter and click Troubleshooting in Control Panel > click Configure a device in the Hardware and Sound > type password if asked. 6. Check Device Manager when the DVD drive doesn't read the DVD after you loading it into the drive. Open the Control Panel > click System icon > click Device Manager (or Hardware in Windows XP and earlier) > highlight the drive and press the delete key to remove the DVD-ROM if there appears a yellow exclamation mark and red X > reboot computer, update or reinstall the DVD drive. This is helpful to get the DVD drive worked again especially when you are running another program and the Windows doesn't recognize the DVD drive. 7. Remove and reinstall IDE/ATAPI drivers. And check if your computer hard drive reads disc or not. 8. If you still fail to read discs in DVD drive after trying all the above steps, it's might be a bad drive. Just replace the drive or schedule a repair and see if the new DVD drive works to read discs. 1. Check Windows Update and install the latest drivers to fix the computer hard drive not working in Windows 10 issue. Click Start > Settings > Update & Security to make sure the system is up to date. 4. Update chipset firmware to solve the computer hard drive not working/missing in Windows 10 problem. 1. Check the solution if your DVD stuck in SuperDrive. 2. Reinstall the macOS or zap the computer's PRAM. 3. Resort to Apple if your MacBook is under warranty or you have AppleCare for it. 5. Replace the drive with a new one, if nothing help. It will cost $100 for an internal replacement drive. Warm Prompt: Windows 10 disables the native DVD playback capability since it removes the Windows Media Center. So even when the computer hard is back to normal, there is no way to play DVD unless you pay for the WMC. But this cannot deprives you from watch movies. 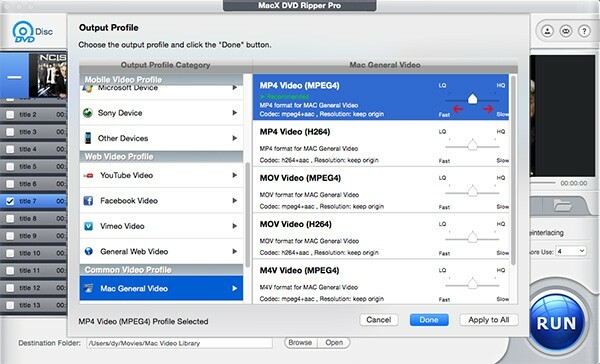 You can rely on MacX DVD Ripper Pro to simply copy and digitize your DVD collection onto your hard drive in a fraction of minutes (just 5 minutes only to rip a full length DVD, depending on your DVD drive speed) and rip DVD to AVI, MP4, MOV, MKV, etc for playback on Windows 10/8/7, Mac, and even iPhone, iPad, Android on the go, so that you won't load your discs in and out of the DVD drive again and again and get them worn out. You can follow the steps below to save your DVD to hard drive to avoid any not working/reading disc again. Step 1: Free download the DVD ripper on Windows 10. Insert DVD into the DVD drive and let the tool analyzes the disc title. Step 2: Choose output format from the drop-down profile window. Here we recommend you to choose MP4 as the output format as it is compatible with almost all media players, devices. You can also rip DVD to MPEG2 for storing on your hard drive. It will take you 5 minutes for a full DVD ripping. Step 3: Click Browse to save the output file and click RUN to begin DVD ripping. After a few minutes, the DVD movie will be saved in your computer hard drive and then you can watch the movie without loading the DVD disc again. MacX DVD Ripper Pro can easily fix all DVD drive not working errors: rip any DVD (homemade or commercial) to MKV, MP4, MOV, VOB, MPEG-2, AVI, FLV, WMV and more to playback on Mac/PC, HDTV without using external Mac DVD drive or DVD player software & hardware.